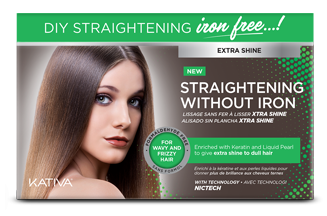 No-iron straightening treatment to be done at home. Free of formaldehyde and guanidine, due to the exclusive NICTECH technology mechanism it straightens hair quickly and with a professional result for 4 weeks. Its formula enriched with keratin leaves hair visibly smooth and with natural movement. Step 1: Wash hair with shampoo, then dry it thoroughly with a towel and a blow dryer. Do not apply conditioner. Step 2: Divide hair in 2 sections and apply treatment mask fraction by fraction, leaving ½ cm from the roots. Make sure to spread the straightening mask fully and evenly covering hair. Leave on for 15 minutes. Step 3: Dry hair with a blow dryer and a flat hair brush, brushing downwards, until hair is straight and dry. Step 4: Flat iron your hair, taking small sections* of it and running the flat iron down 8 to 12 times at 200°C y 230° C (392°F a 446°F). VERY IMPORTANT: A good ironing guarantees the best result. (*)For fine or damaged hair, we recommend quickly running the flat iron, especially on hair tips, or otherwise lowering temperature to 200°C (392°F). Before starting with step 5, wait 5 minutes for your hair to recover its initial temperature. Step 5: Wash hair with shampoo and apply Post Straightening Deep Treatment. Leave on for 10 minutes and rinse with abundant water. Then dry hair, preferably with a hair dryer. WARNING FOR DYED HAIR:This product may cause variations on hair color. We recommend using it the next time you will dye your hair. On dyed hair this product may cause variations on hair color. We recommend straightening before the date of your next dyeing session. For abundant hair or very long hair, we recommend using 2 kits. Regular use of this product progressively straightens hair. 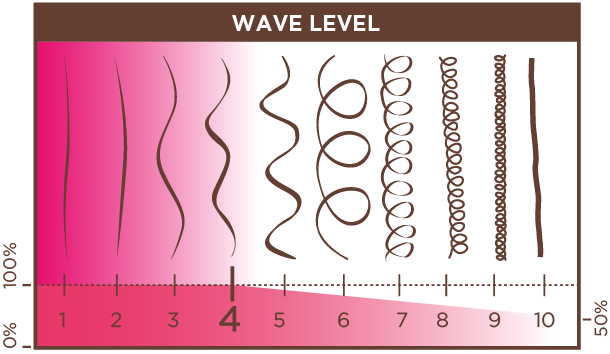 Product effectiveness varies according to hair waving. For a better daily finishing, activate the memory effect using a blow dryer. 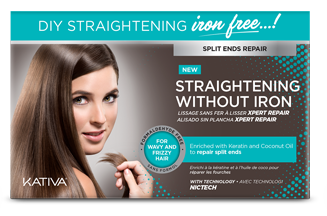 To make the straight effect last longer, use Kativa Post Straightening or Kativa Keratin products, which can be found in several points of sale. This product may cause variations on hair color. We recommend using it the next time you will dye your hair. Can I use Kativa Keratin No-iron Straightening if I went under other straightening processes before?? Yes, you may use it on hair that received previous straightening treatments. Can I use Kativa Keratin No-iron Straightening on dyed hair? Yes, you can use it on dyed hair. We recommend using it not long before your next dyeing session, because this product may cause variations on hair color. 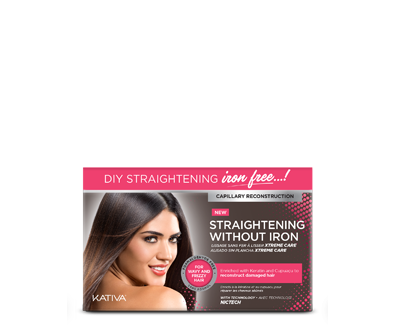 Can I use Kativa No-iron Straightening after dyeing my hair? We recommend dyeing it after the straightening treatment. You may dyed your hair the same day without any inconvenient. 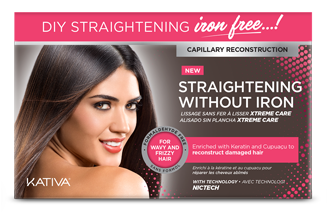 How long does the Kativa No-iron Straightening treatment last? The treatment lasts for 4 weeks if the process if conducted correctly. Does steam is produced during the Kativa No-iron Straightening treatment? Yes, moderated steam is produced, which is not toxic or irritating, due to the effect of blow dryer on wet hair. 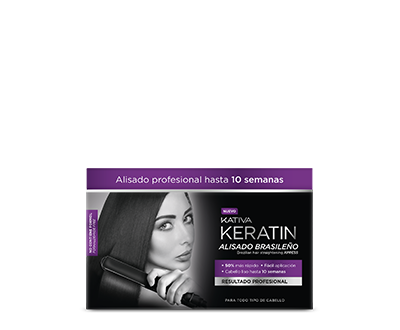 Kativa No-iron Straightening does not include any substance forbidden for cosmetic use in its composition. 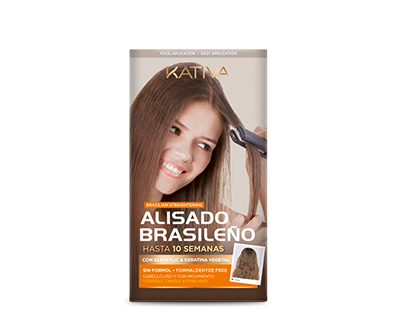 Can I tie my hair, or use hair clips after using the Kativa No-iron Straightening treatment? Yes, you can tie your hair as usual, without altering your hair straightening. What shampoo and conditioner shall I use after the straightening treatment? You may wash your hair that same day. There is no problem with that. How often shall I straighten my hair? The result will last up to 4 weeks. But the process may be repeated one week after the first application, if so desired, provided that hair is not sensitized by bleaching or other treatments. The continuous use of this product progressively improves the result of hair straightening.